On the base of long enquiries, exposed in my book “Atlantis. A vanished world, a hypothesis in order to find it again ” (Liutprand, 2001), I think that Atlantis, the mythical kingdom described by Plato in his Dialogues, really existed and that it was at the centre of the Mediterranean Sea. The debate on Atlantis begins by the witness of Plato. Fantastic and esoteric considerations would want to connect the “missing continent” to very ancient human cultures (of tens or hundred of thousand years ago) or even with E.T. colonisation. It is instead important to turn us to the period immediately antecedent to the written history, in which the memory vanishes in fogs of epics and myths of the ancestors of the Greeks, who arrived to the Mediterranean Sea in between 2000 and 1500 BC. Armed with iron, they imposed to the cultures of the bronze and banned the matriarchal society, in the name of a new masculine rule, in the family and in the religion. In epics populated by Gods and Half–Gods, Giants and Titans, the process of formation of the ancient nations is shaded, and in this foggy swamp Plato places the existence of Atlantis, in an age whose protagonists had the names: Poseidon, Athena, Zeus, Atlas, Erakles, Minosses… ancient kings, transformed by the myth in Gods and Titans. It is believed that Solon has carried on his travel to Egypt, which Plato refers, towards 570 BC. He related facts would had occur 10,000 – 9,000 years before, but, if the “9,000 years” of Plato must correspond to a long period, yes, they would be however comparable to the times of the Achaeans and the Dorians, after their settlement in the Mediterranean. Eudossos of Cnydos (mathematician, geographer and Greek astronomer), and after him also Maneton and Diodorus Siculus, explain that it is necessary to mean “months” where Plato wrote “years”. This would place the period of the great expansion of Atlantis, and its war against the ancestors of the Athenian, between 1320 and 1295 BC, while the tremendous catastrophe that destroyed that kingdom would have happened thousand months (approximately 80 years) after, i.e. between 1240 and 1210 BC. It is natural that the human groups settle in the lowlands, in plain. If today the mean sea level had suddenly to raise up 130–200 m, nearly no trace would remain of the technological development: sources of energy would disappear… only few traces would remain of them in the myth. If this happened along some tens or hundred years, it would consent the human migrations to plateaux, but if the first big wave was unexpected and very strong… it would be the end for the very heart of the developed societies. The possibility appears therefore obvious to find traces of human settlements, more or less ancient, in every part of the world, under the seawaters, until to some hundred meters of depth. My quest has been based on the existence of two closed water basins, one more elevated and the other in depression regarding the general level of the Oceans, and a third sea (the western Mediterranean), in communication with the Oceans through the passage of Gibraltar. A strong earthquake would have caused the catastrophic passing of the lowland of Atlantis, with a new conformation of the seacoasts. – the characteristics of Atlantis are those of a society of seamen and of agricultural habits, with social structures articulated and the acquaintance of the metallurgy of gold, copper, bronze. The ancestors of the Greeks were present in the Eastern Mediterranean in a period comprised between 3000 and 1500 BC, correspondent to the first 20 dynasties of Egyptian Pharaohs. We have the sensation to know all, about the history of that period, but we know really little enough, and the majority of the history is wrapped from the myth: Homeric poems, legends of the Greeks at their origins. According to my quest, before the catastrophe an immense fertile plain existed, like that described by Plato, in front of today’s Tunisia, between the Small Syrte, the Gulf of Gabès and – towards north – the peninsula of Cape Bon and the western extremity of the Sicily. It would have been “the far West” of the Eastern Mediterranean, in which Pelasgi navigated, its mythical first inhabitants, a land rich in elephants and other African cattle, with dates and bananas, like Plato says, protected from the cold winds by the mountains of Tunisia and Sicily. In this zone there were “Erakles’ columns” of the Greek myth, and the locations of other myths connected with Afterlife and with the reign of the death, the Garden of the Hesperides and the kingdom of Atlas. We imagine to go back in the time, 3,300 years ago. Mediterranean Sea had to be distinguished in two seas, placed at different levels and deprived of mutual communications. 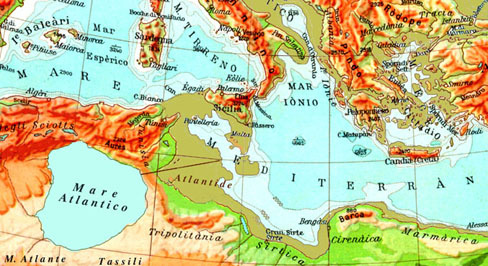 Eastern Mediterranean, from the Small Syrte to the Syro–Palestinian coast, comprised the Ionian sea, the low Adriatic and the Sea of Candia (while the Aegean territory, all emerging, constituted an immense studded plain with mountains and ancient volcanoes). Instead of the strait of Messina a rocky isthmus existed and the channel of Sicily was then a fertile plain, watered by rivers and protected by high mountains, that came down sweetly towards the coasts of the inferior sea. The waters of this sea had to be approximately 300 m under today's one. Not far away from the island of Malta, two tightened mouths gave approached to a great gulf, deep beyond thousand meters. Around that gulf, which mouth was protected by a wide island, a flourishing civilisation was risen, founded by Libyan people, went down from the high southern mountains. Who had come from east, from Clay or from Egypt, would have seen a coast full of rocks, rather steep, in which two straits were opened, to sides of a wide island. Behind Pantelleria, at the end of the gulf, there was the other sea, next to overflow towards the gulf. The Western Mediterranean was – like today – in communication with the waters of the Oceans, through the strait of Gibraltar, and its waters had a level similar to today's one. This was the true malediction hanging on the head of the people that it inhabited those lands (Atlantis). Perhaps they were convinced that the precarious equilibrium could last in eternal, as they had always known. To the west of the gulf, between the two seas, a wide, fertile plain spread, abundantly watered, thanks to the waters coming from the wide “inner sea”, whose waters had to be rather sweet. That extension of plain corresponds, for its measures and physical–climatic characteristics, to the territory described by Plato. From the coast, the plain went up sweetly towards hills of volcanic origin, rich of metals. Approximately 450 km from the Mediterranean, there was a wide “third sea”, an inner sea of sweet water, about 650 m higher. That sea collected waters of a river basin, extended to south until the Tassili and Ahaggar Mountains (“the mount Atlas”, according to Herodotus). Its waters watered lands of the immense plain. At the bottom of that sea, today, there is a great sand sediment, the Eastern Grand Erg (Igharghar), one of the most extended sand deserts in the world. That world ended in 24 hours, between 1240 and 1210 BC. A series of earthquakes seriously cracked the consistency of the rocks and opened channels, which very soon were broken by the pressure of waters of the higher seas: the Saharan sea and the Western Mediterranean, constantly supplied from the waters of the Ocean. Atlantis was destroyed and buried forever by a titanic flood of water and mud. Diffusionist students assume the existence, in ancient ages, of travellers and of logons ocean–going liners and transpacific, of marine contacts between the continents. For them, the development of the Mediterranean cultures has to be seen as “a barbaric Middle Age”, caused from the supremacy of warriors iron–armed, against the more developed merchants, who had discovered the technologies to fuse gold, copper and bronze. Seafaring Africans, Polynesians, Chinese, Phoenicians. Who were the Phoenicians? The historians describe them as the first, between the great navigators. According to Zapp and Erikson, they were rather “the last” great navigators of Antiquity, with the Celts (whose oceanic fleet was destroyed by Julius Caesar, in a famous naval battle). We can presume that the Phoenicians were great navigators, who dominated the Eastern Seas, while Atlantis and the Celts dominated the Western routes. Herodotus written that the Phoenicians arrived to the Mediterranean shores from the Red Sea, about 1200 BC. They adopted a writing with alphabetical typing, model for successive letters used in the European alphabets, but no written report of their enterprises remained. Their civilisation is described like always looking to the sea, to the commerce and the discovery of far lands. During the age of bronze they went to find copper and pond from the mining zones, but their commerce kinds included gold, spices, purple from which – second tradition – their name derives, meaning “the Red Men”. After 539 BC, after the conquest of the Eastern coasts by the Persian power, Carthago became the Mediterranean centre of Phoenician culture. According to ancient reports, the Phoenicians and then the Carthaginians knew a far island called Antilla, full of every kind of wealth, and created the legend of the lost continent, in order to be guaranteed of the exclusive acquaintance of the Atlantic routes. In the fifth century BC, many Carthaginians sailed towards “the new greenish island” and the city risked to become depopulated itself, so the governors had to forbid to go beyond Erakles’ columns. Diffusionist students think that Phoenicians and Carthaginians knew well the routes of trade winds, later explored by the fleet of Columbus. The island of Malta was the ancient fortress of Kalpe, i.e. one of the primitive columns of Erakles (and, still before, the shrines of Cronos, Melkart, Atlas). It was overwhelmed by the enormous wave, which destroyed the heart of Atlantis, coming from the gulf of the Syrte. The blocks of monuments, high beyond three meters, appear pulled down by enormous waves, coming from the West, that pushed them to 5–10 m from their places. The only possible explanation is that an immense wave of water, directed from the west towards east, caused the incredible destruction. A scholarly author who calls himself “Michael of Greece” relates a series of conflicts between Greeks and Cretans. Who were the heroes of that war? We try to find again in the myth and the story of Pausania the names of the kings that appear in the story of Plato. Cecrops (son of the first mythical king Ethos), opened the hostilities against Atlantis, represented by the cult of Poseidon and Titans. In other myths, the same episode is introduced as if Athena, natural daughter of Poseidon, had denied her father to recall herself as daughter of Zeus. It was the end of the matriarchal rule, as St. Augustin remembers. Proclus suspected that in the conflict between Gods and Titans the wars supported from the ancient inhabitants of Athens against the people of Atlantis and its allies were disguised. The Ancient fixed also the more probable date of the victory of Gods against Titans, corresponding to 1505 BC. In the Egyptian tradition, “the Giants attacked Zeus and Osiris, but were destroyed”. We find the assonance between the names Atlantis – Titans and that one of Tanit, the great mother of the Berber Pantheon. A Norman Saga titled Oera Linda tells about blond people, original of the Frisia, with matriarchal traditions, who, after a deluge that destroyed their fatherland (called Atland), migrated towards the Mediterranean, ruled by a warrior princess (the goddess Athena of the Greeks), and founded Athens. According to Oera Linda, Cecrops was the son of a Frisian woman and of an Egyptian clergyman and was “half man and half snake”. This myth of migration can reflect the arrival of the Achaeans and the Dorians to the area of the Eastern Mediterranean. Cecrops was the first man to name Zeus as the supreme God and to abolish the sacrifices of blood, or human, or of animals. He came from the Egyptian city of Sais. Under his kingdom the dispute between Athena and Poseidon had place for the control of the city of Athens. That dispute may concern the supremacy of the Cretans (Atlases, or however their allied), devout to the cult of Poseidon. Other kings fought against external aggressors (always described as allied with the Cretan and – we will say – with Atlantis). They were the successor ones of Cecrops: his direct successor Erysichton and – three generations after – Erichtonios, defined as an “usurpator”, son of Ephestus and of the Earth – Gea): perhaps it is the indication of an other invasion? At last, his grandson, Erecteus. They are all kings and heroes who lived before Teseus, who appears as the last heir of Erecteus. Erictonius instituted the pan–Athenian festivities, in honour of Athena, but its successor, Pandion, was probably a Cretan. The son of Pandion, Lycos, is reported by Herodotus as the founder of the kingdom of Lycia. We will find again the Lycians between the Peoples of the Sea, who tried to invade the Egypt shortly before 1200 BC. Apollodorus remembers that, under the kingdom of Pandion, “Demetra and Dionisus came to Attica”. The first was a Cretan divinity. Also under the reign of Pandion, we find mention of wars. One his successors, Erecteus, had to endure of attack of “a devout person of Poseidon”: Eumolpus, king of Eleusis (a city allied to Crete). Athenians had to defend themselves, with the aid of mercenary troupes. According to Apollodorus the fortune helped the Athenians, but Poseidon, angered, destroyed the house of Erecteus, on Acropolis, and killed him with all his family. Michael of Greece concludes that these myths do not speak explicitly of a war between Athens and Crete, neither between Athens and Atlantis. But Poseidon is taken away from the cult by the Athenians, matriarchal rules end and a series of sour conflicts (between Gods and Titans) correspond with the narration of the war between Atlantis and the ancient Athens. According to the myth, Atlas and Cronos were brothers, sons of Uranus. Atlas received in inheritance the reign dell ’ the West, Cronos that one of East. Both – therefore – were celebrated as the progenitors of kings. We remember that in the myth Erakles and Atlas exchange for a moment the task to support the weight of the world, while Atlas collects for the hero the knobs of the Hesperides… exchange of roles in the kings’ generation? Someone thinks also Promethium to be a brother of Atlas, but we know that often the myths interlace and become complicated. According to the Phoenician, Cronos began to suspect of the brother it buried and it underground. According to the Greeks the contrary happened rather. Atlas succeeded to Cronos and lead the Titans in war against the Gods (the conflict between the ally kingdoms of Atlantis and the Athenian and the Egyptians of the Delta). In the third millennium BC, we can suppose the existence of a marine power in the channel of Sicily, managed from people coming from the region of Ahaggar, from the heart of the Sahara, where still today “the blue men” indicate the crib of their own nation and remember the mythical ancestor queen, Tin Hinan (name that recalls “Tjehenu”).They were the Atlantoi of Plato, of Herodotus and Diodorus Siculus, the Tjehenu of the Egyptian reports. There was a civilisation, which dominated on the seas: towards the west, to conquest the oceans (they were the only ones Mediterranean able to make it, beyond the Celts, since their earth blocked the heart of the Mediterranean itself). To east, in the colonies of Crete and Thera, traces of their influence can be found, but the destruction of the primitive focus of spread makes that we call as “Cretan” also all things that one find in western areas (Iberian peninsula, British islands and beyond, until to some elements of the cultures pre–Mayan in Central America). After 2000 BC, the ancestors of the Greeks (Indo–European armed with iron, probably related with the Vikings, as also the book Oera Linda says) came to the Eastern Mediterranean, carrying their own myths, as the Homeric poems, and directly living other vicissitudes which became like myths of the origins. The fight between Titans and Gods would be the mythical translation of the war between the peoples of Attica, allied with the Egyptians of the Delta, and the Atlases who wanted to submit them. It is the period of maximum expansion of the Cretan culture. The eruption of the island of Thera (between 1480 and 1440 BC) gave a decisive blow to the Cretan power and facilitated the revenge of the Mycenaeans. The Eastern Mediterranean remained an inner sea, with a level about 300 m lower that the present, and the harbours, the fortifications and great part of the trade cities have never been found: they have to be found offshore, below the sea. Towards 1200 BC, the final catastrophe. The “Sea Peoples” swarm in quest of new lands, the Philistins seek to settle in Palestine and the “red men” (Phoenician), become the heirs of the secrets of the great navigation. All this story appears to be exquisitely a Mediterranean one, because of the myths, the catastrophes, the bloody wars and the fights between the ancient matriarchal cult, based in the sacred islands of Malta and of Crete, and the new rituals of a Pantheon ruled by male figures. As Mediterranean, not to demand any “self–exculpatory projection” along far oceanic routes. Atlantis and Phoenicians return overbearing in graffitis and scripts found on the New Continent and on the islands of the Pacific, which narrate in Libyan characters and language about the reports of ancient travels, of seafaring men named Rata and Maui (“the waterman”) who became the guardian geniuses for many peoples of Polynesia. Very astonishing: the same decoders have scrambled up on the mirrors, in order to explain how those navigators could express themselves in Libyan. Nobody of them thought that the empire of Atlantis, sealing outside of the Mediterranean, had been the crib of Libyans and Berbers. How we could therefore speak of a “fake”, if they discovery was difficult to explain just for whom had it between his hands? It would have been easier – for them – to create a fake in Egyptian or Greek characters. If the Diffusionist students did not made it, they could not certainly have counterfeited the materials they found.